The GNFAC along with the Friends of GNFAC and ASMSU are sponsoring this course. The workshops will be held on Wednesday and Thursday evenings, with a field course on either Saturday or Sunday. Different topics will be presented each evening. Topics include: avalanche terrain recognition, the effect weather has on avalanche hazard, the development of the mountain snowpack, decision making skills, and basic search and rescue procedures. 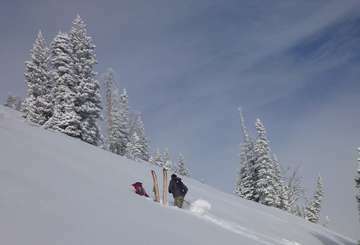 Participants in the field course should have basic skiing and snowboarding skills with the appropriate equipment to negotiate “groomed” intermediate ski runs. Please bring skins or snowshoes for uphill travel. Although not required, an avalanche rescue beacon, shovel and probe will be very helpful for the field session. You MUST attend both classroom sessions to go in the field on the weekend. Optional: $10 ($12 at the door) for a copy of "Snow Sense: A Guide to Evaluating Avalanche Hazard"